When it comes to helping strangers, what kind of ape are you? You might think altruism is a uniquely human trait. For example, when lending a helping hand, chimpanzees tend to favor their friends. But do other primates show more compassion toward strangers? Jingzhi Tan at Duke University looked at bonobos, a close relative of chimpanzees. He placed one group of bonobos in a room. Then he put a single, unacquainted bonobo in the room next door. An apple was then hung so it was unreachable, but visible, from both rooms. The single bonobo could pull a pin to deliver the apple into the neighboring room. The point? To see if single bonobos were willing to help a group of outsiders. And? 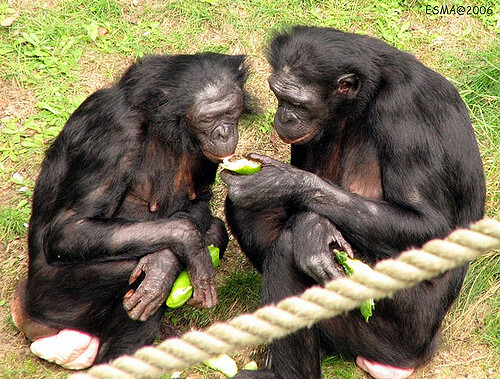 The bonobos were happy to pull the pin and help their fellow apes to a treat! Even without the promise of a reward! So don’t be a chimp! Channel your inner bonobo! Give up that Trader Joe’s parking space. Or at least, an apple.